The purpose of this policy is to detail how our office furniture is delivered and assembled in metro areas as detailed below and all other areas of Australia. Paperwork and payment must be completed before pick-up is possible. Payment cannot be made at the warehouse. 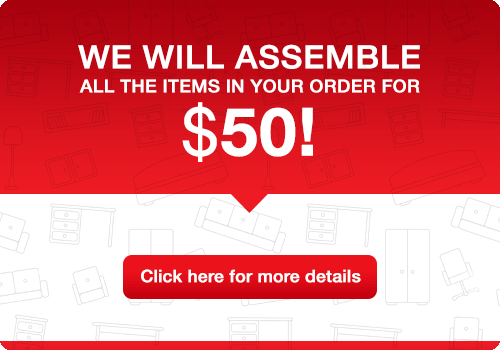 Items will be supplied boxed and will need assembly. Basic tools will be required to complete the assembly. Items will be delivered boxed and dropped off at Reception or as instructed. Basic tools will be required to assemble the furniture. Items will be delivered boxed or palletized. Boxes will be dropped off at the nearest ground floor entrance. Delivery is priced for a ground floor drop off only. If boxes are palletized and no forklift is available, the driver may require assistance to unpack the pallet. Basic tools will be required to assemble the furniture. Please note – Orders will be processed as soon as all paperwork is finalised and payment received – unless otherwise agreed in writing in advance. Delivery in Metro areas will generally take place within 1 – 5 working days after paperwork is finalised and payment received, providing all items are in stock. Assembly crews are generally very busy and this may delay the lead time if an assembly is requested. All deliveries take place from Monday to Friday between 8.00am and 5.00pm. We do not deliver over weekends. We are unable to give an exact delivery time as many variables affect trucks in transit. We will request that drivers call beforehand to give some notice of their arrival, however this is not always possible and the expectation is that customers or other nominated persons are available on the delivery day to meet the driver. Items to be shipped interstate or to country areas, will generally leave within 24-48 hours of the order being processed via local couriers after payment has been received and providing all items are in stock. Whilst we endeavour to minimise any delays, Fast Office Furniture has no control over delivery time-frames once the shipment has left the warehouse by third party courier. Fast Office Furniture will advise customers in good time of a delivery date by email. All customers to ensure there is someone available to meet the driver. All customers to ensure that a valid contact phone number is supplied for the driver. It is strongly recommended that a second backup phone number is also available for the driver to ensure that the delivery is not missed. It is an expectation that our clients will equip us with all possible information pertaining to the delivery e.g. above ground delivery; lift or service lift access; loading bays or loading dock availability; street parking; opening hours if not open 8.00am – 5.00pm Monday to Friday; site contact details if not the same person placing the order etc. If a Site Induction is required, please advise us at the time of requesting a quote. Charges apply for all inductions which take longer than 10 minutes. In the case of a flat packed delivery, the customer may give authority for the goods to be left on site in a safe place. (Customer to call or email our office to confirm). If no-one is on site to give access to the driver and no authority has been given to leave the goods in a safe place, the order will be returned to the warehouse and the delivery will have to be rescheduled. A delivery which has to be rescheduled due to customers not being available on the delivery day and not informing the office in good time (at least 24 hours before delivery if possible), will incur additional fees i.e. a $40 Re-Delivery Fee and a $20 Administration Fee (Total Fee $60.00). This fee is to be paid before the delivery is rescheduled. Payment can be made either by phoning the office with credit card details or by bank transfer. Fast Office Furniture shall not be liable for any losses incurred by the buyer or any other person as a result of any delay in the delivery of the goods, or any part of the order for any reason whatsoever. We need to know if there is a loading dock with time or height restrictions to ensure we send the correct size vehicle in the correct time frame. Failure to provide the correct information may result in the truck turning back and the delivery having to be rescheduled at the customer’s cost. Our drivers/installers are not permitted to relocate/disassemble/assemble or dispose of any existing items which may be on site and which are not part of the new order. Any existing furniture/items which may be in the way or no longer required, must be moved out of the way before they arrive, to ensure a smooth and efficient process. To this end, we take the Heavy Vehicle National Laws (HVNL) – Chain of Responsibility (COR) very seriously and will endeavour to ensure that all freight packaged and delivered on our behalf is done so correct and safely. At Fast Office Furniture we pride ourselves on doing our utmost to achieve the best outcome possible for each client. Working together with our customers by keeping communication clear and concise will ensure that the delivery/assembly process is efficient and seamless.